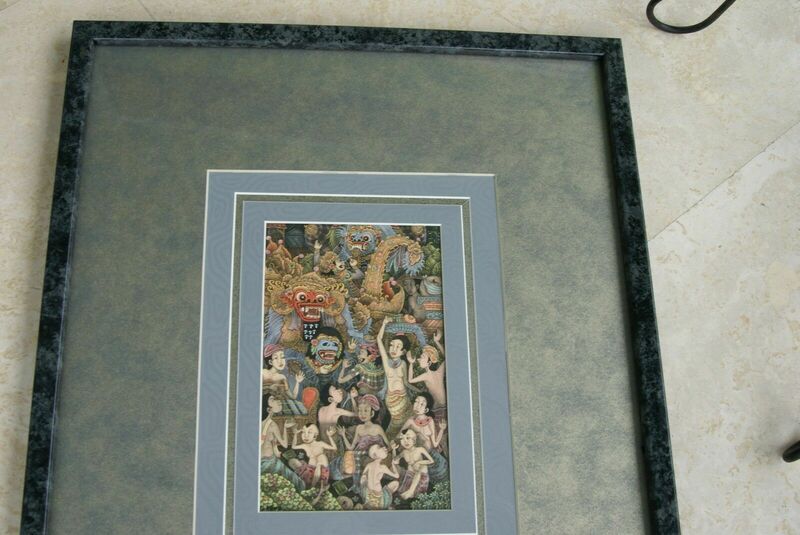 ORIGINAL MINIATURE TRADITIONAL BALINESE UBUD PAINTING FROM KNOWN ARTIST Perfect but on some of the photos you see the reflection of my round table on the glass, if you check all the photos, you will see some taken later, further from that table, and on those few photos, you do not see the reflection anymore, sorry about that, i realized this too late, after listing. 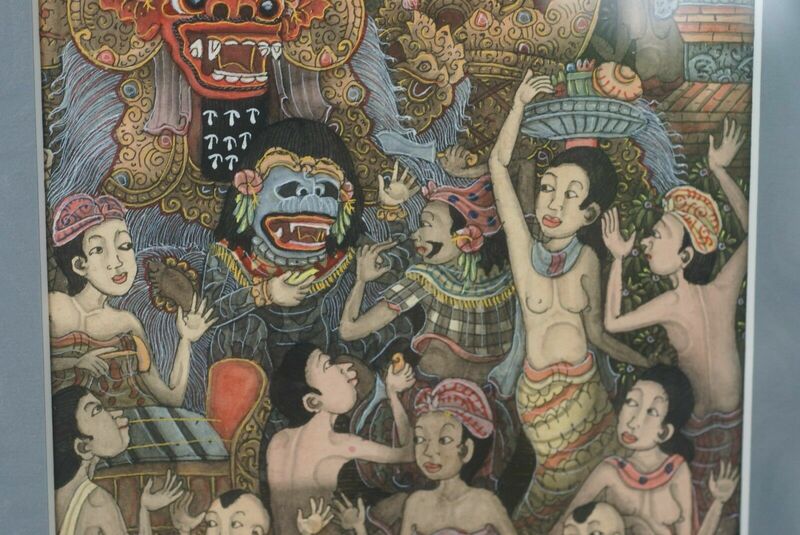 Traditional temple scene, celebration for the Gods with Barong and Rangda masked dancers representing the battle between good and evil. 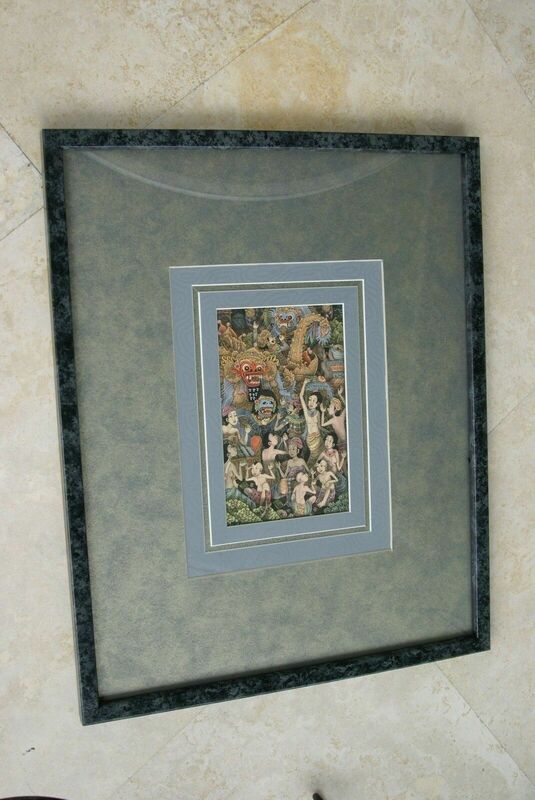 Framed in a custom hand painted frame with 4 mats, 2 of them hand painted as well to enhance the painting. 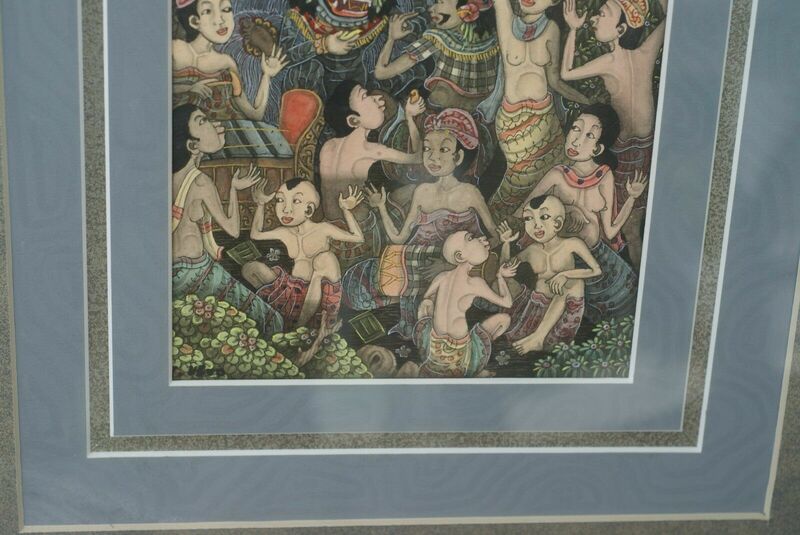 These ink paintings are now very expensive in Ubud, Bali, reaching 100.00's of dollars because of how time consuming they are to create. You also see less and less of them. 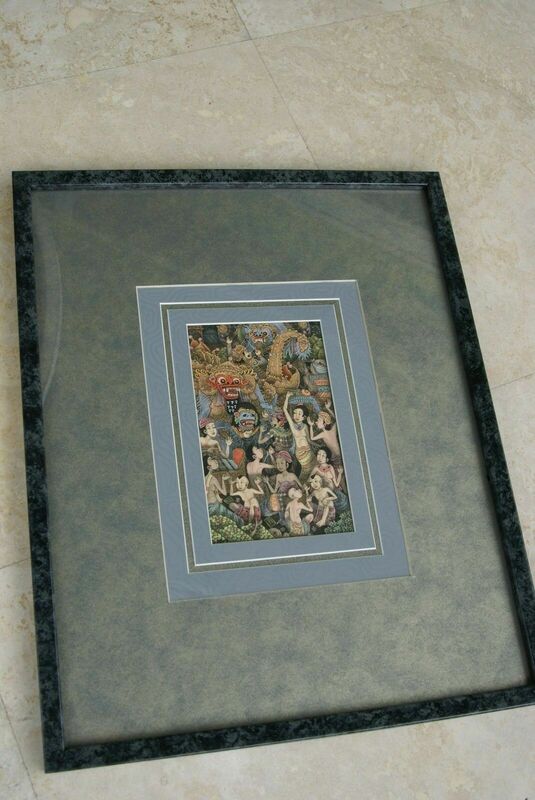 Item: DFBT20, size: 21" X 17" seen on all the pictures. 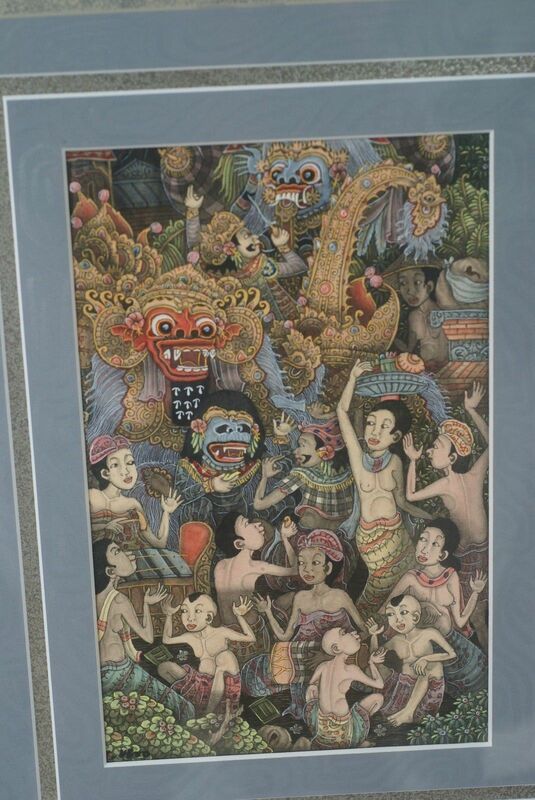 This is a signed original authentic extremely detailed very traditional ink painting by a talented local Pengosekan artist, which took over 1 month to complete because of minute excrutiating miniature details. 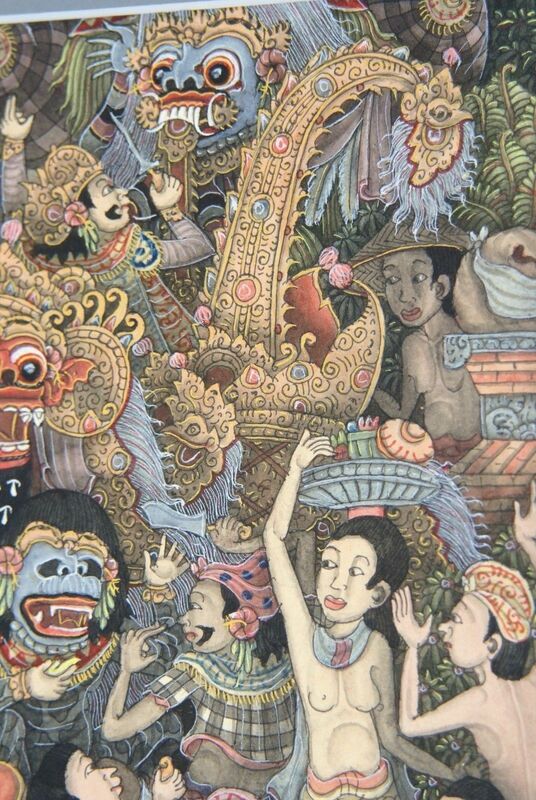 The beauty and variety of Balinese paintings have gained the admiration of many scholars. 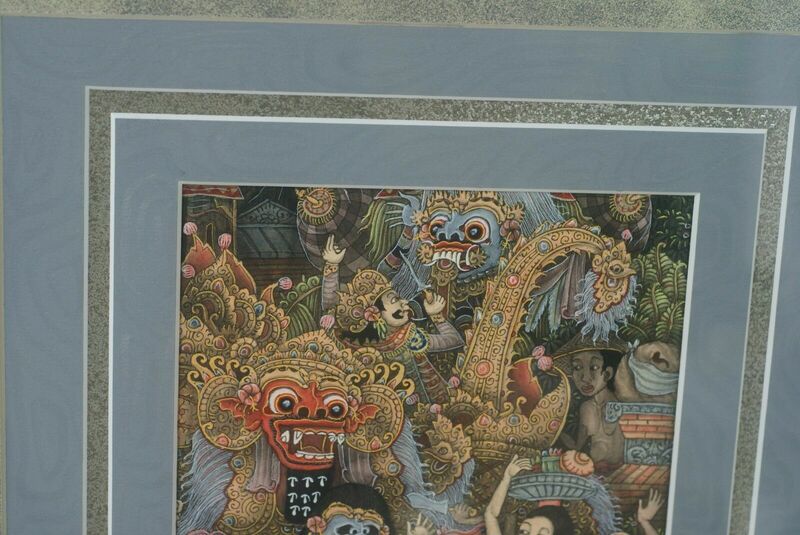 Previously, as here, the portraits of classic Hindu epics dominated the form of Balinese paintings. 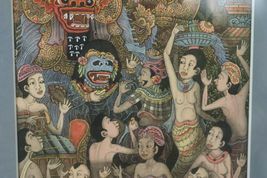 Painting was understood as a form of prayer, if not to the Gods, then to the local palace, perceived as an embodiment of the holy. 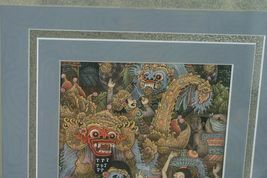 Artists would thus labor at the palace to demonstrate their loyalty to the king, or work at the temple to demonstrate their loyalty to the religious community. 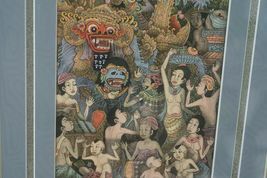 The theme of these traditional Ubud paintings such as this one was around the Wayang, including stories of the gods and popular folk stories. Most importantly, this art was an expression of the community. 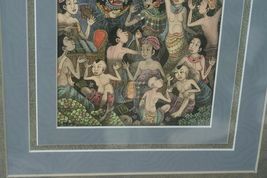 Artists often do not sign their work, and they were always proud if their students copied their style. 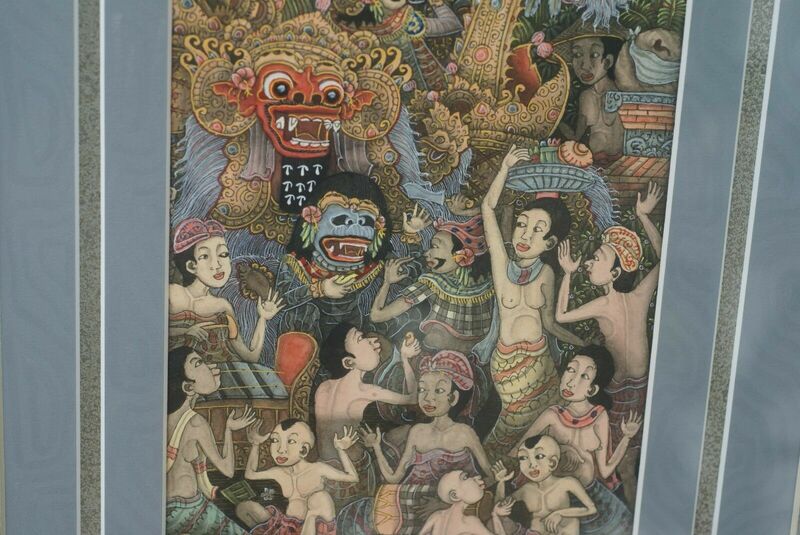 To have their work imitated meant they had attained the status of a Guru, the highest honor for a Balinese. 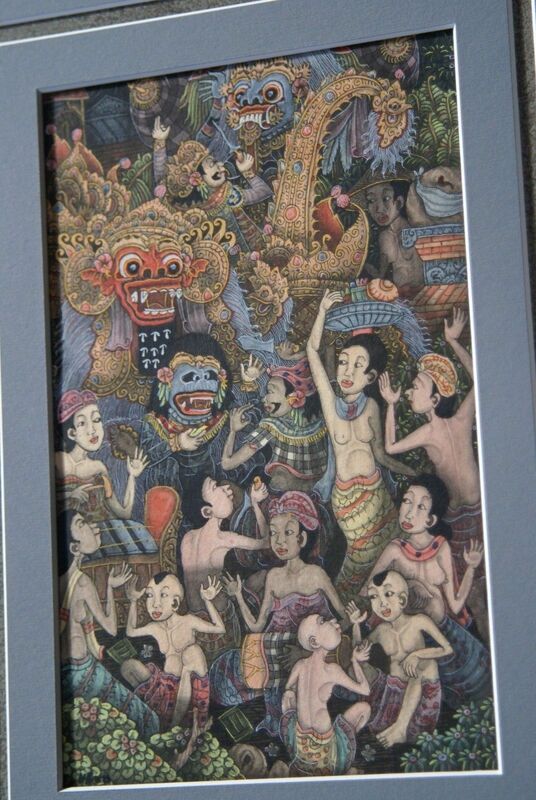 Painting is an authentic traditional art. 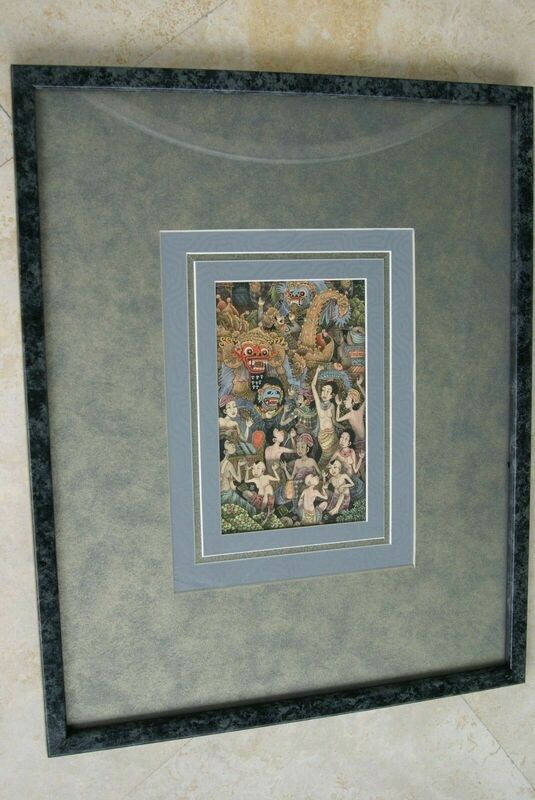 We also carry original authentic prints 300 years old or less, framed or not, in great condition such as: Albin, Audubon, Baron, Barraband, Bertuch, Brodtmann, Brown, Buffon, Cassel, Curtis, Cuvier, Donovan, Edwards, Fitch, Frisch, Grandville, Harrison, Walter Hood, Latham, Linden,Linnaeus, Loddiges, Martinet, McKenney, Morris, Munting, Redoute, Reinchenbachia, Schreber, Schubert, Selby, Shaw and Nodder, Van Geel, Warner, etc.... etc... Again, we closed our art store of antique prints and custom frames as well as our store of rare artifacts from around the world and we will now sell them direct by listing them regularly. We have 1000's of antique prints and it will take a while to do so, so if you are interested in prints from the names above or others since I did not have time to list them all, please contact us.